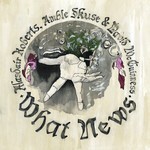 A collaboration with early music scholar David McGuinness and electronic sonologist Amble Skuse, What News is Roberts' fourth album of entirely traditional material. Ali sings some of his sweetest/deepest vocals ever atop David McGuinness' assembled keys: an 1844 grand pianoforte, a "Mozart-style" forte piano, and a century-old Dulcitone. Amble Skuse's electronics keep the 21st century in the picture.